Let It Be (1970) – Movie Review – Another Movie Blog! It’s weird to think that I am writing a review on an Oscar winning film that you can’t watch in any official capacity (that is not a black &amp; white film lost to the ages). 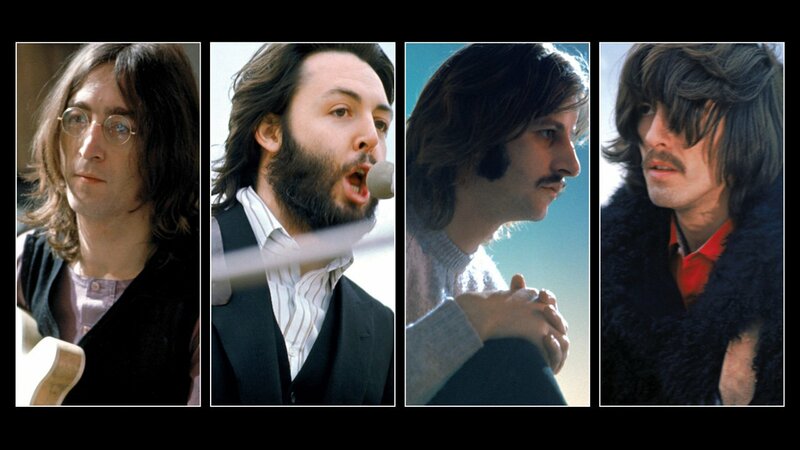 Its even weirder to think that happened for The Beatles, the biggest band to ever walk the planet. Yet here we are with Let it Be, winner of Best Original Score in 1970 and a film that you can’t watch in any certified quality. Copies exist of course, and the footage of the Rooftop performance has been cleaned and presented for the world to enjoy, but in these unofficial release the footage is rough, unrefined, like we are watching home movie footage as opposed to a screened film. That helps to make process of finding and watching the film, and the format in which its watched, become part of the experience with the film itself. But it is not as though the intimacy which this creates was an unintended part of the film to begin with. Aside from in studio photography, this is Beatles fans main hub of footage and knowledge when it comes to how the operated inside the studio creating songs. The cameras get close to the performers, in the middle of the spaces they are working, the editing somewhere between cinéma vérité and the first cuts made sporadically on a Steenbeck (I won’t pretend the editing is good, but it is affecting, which in most cases is enough). This wasn’t the typical style of how the band created music, the creation of songs through jams and live performance being Paul’s attempt for the band to get back to where they once belonged. But the result is a combination between in your face and fly on the wall, similar to how the band are from one scene to another in the performance space and traipsing along the sides. Michael Lindsay-Hogg would years later shoot the TV movie Two of Us in 2001, about a meet up between John and Paul post-Beatles, so its safe to say he has some emotional, long lasting value in the legacy of the Beatles. However, as a result of that tendency to deify there is a certain amount of sycophancy, or at the very least an inability to get to a complete truth (which we will get to), also going on that with just how long we stay with the band when nothing is going on other than the band sitting around that cannot be ignored. Apparently there was once a a 210 minute, Beatles approved version of Let if Be, which would have either been more honest or just unbearable (thankfully this version is 81 minutes, which is a suitable amount of time to gaze in the studio without our eyes closing from being tired/bored). When watching the film its hard not to see why George Harrison was particularly down on the film’s release, and as a result of his death why the representative state of his family still veto the film’s official release. At the same time both the director and the Beatle fail to recognise that film does get much beyond that scene. That incident is small compared to what actually happened in those sessions. We know for example that George Harrison left the band for a period of two weeks, and Eric Clapton was considered to replace him (which, given Eric and George’s personal relationship, probably wouldn’t have happened.) That is the reason why the great Billy Preston came to the studio to help dissolve the tension, but in the documentary that creates a period between the switches between the first melancholic blue room – what a metaphor! – and the more traditional performance space that is missing from the movie, making it lack coherence. A smaller example comes from what on screen comes across as a very sweet moments, when John and Yoko waltzing around the studio whilst the rest of the band rehearsed “I Me Mine”. In the film this is one of the films most charming highlights, but off-camera John would listen to the song and tell George, sarcastically “We’re a Rock and Roll band!” (I’m willing to give this story a benefit of doubt, since as the creator of “Revolution 9” John Lennon was probably joking about the band’s position at the point rather than George’s song). You could argue that all these cuts are an attempt to get to some Herzogian “ecstatic truth” about the band, a tense but similar unified group of performers, made clear when the band are rehearsing “Octopus’s Garden”, “Maxwell’s Silver Hammer” (Mal is clearly hitting that anvil! Controversy resolved), or the many snippets of songs that either never became fully fleshed thoughts or that we would never hear. But at the same time it creates a muted truth, a weirdly uninteresting truth, one that we could pretty much gather from the album’s themselves. I say they did. It makes a perfect end to an imperfect documentary, and the combination of raw talent and cheeky self deprecation that represents just what people like about the Beatles. As a documentary, Let it Be is pretty averagely presented. But as a document for a period in the band’s life between collapse and charisma, the vessel for some amazing songs, and of course the rooftop concert, it’s worth a watch. So there’s my analysis. I hope I passed the exam.